Staying married sometimes requires planning and help. Prenuptial and Postnuptial Agreements can be strong and useful planning tools, just like wills and trusts. They can protect family businesses and inheritances, and can help couples plan their lives together. Mediation is a safe and neutral place to discuss your plans for a joint future. When prenuptial and postnuptial agreements are created collaboratively, families are strengthened because everyone has a voice and buy-in to a clear plan for their family. Click the links below to learn more or if you would like more information please do not hesitate to call us at 508.655.5980 or e-mail us. 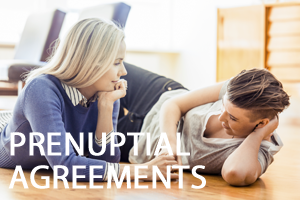 A Prenuptial Agreement is a contract formed by a couple prior to their entering into marriage, setting the alimony or other property rights of the couple. Prenuptial agreements can define and limit property and support rights in the event of a divorce or as part of estate planning. While most people think of prenups as divorce planning, the estate planning portion can often be more important, especially for second families. Do you want to stay married to your spouse? 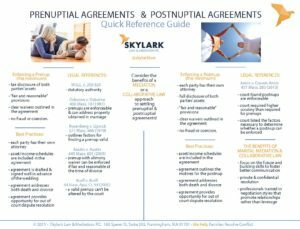 If so, negotiating a Postnuptial Agreement is one way to put some of the difficulties you have been having in your marriage on the table for an open discussion with your spouse. 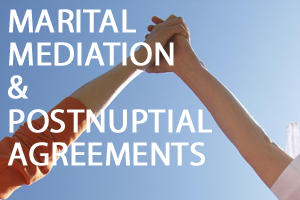 Marital Mediation can help you strengthen your marriage, settling legal or financial issues that may be getting in the way of meaningful reconciliation.